Dunkin’ Donuts is well known for its coffee — it is even considering dropping “Donuts” from its name to highlight its beverage options — but for regular coffee drinkers, Starbucks has the highest brand health metrics in the category by a significant measure, according to YouGov BrandIndex. 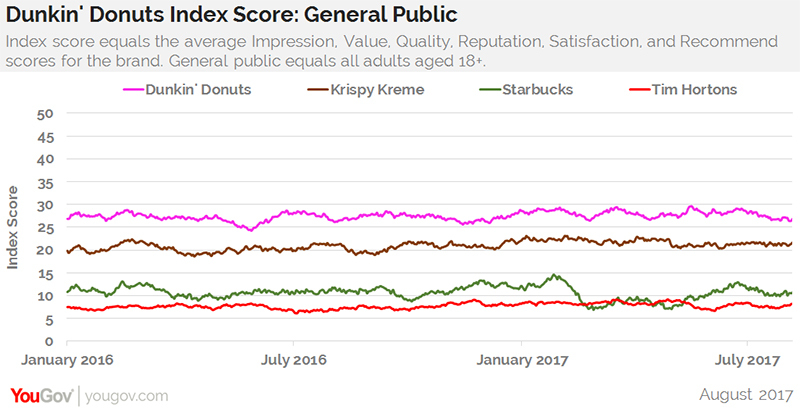 That said, Dunkin’ Donuts has the highest brand health score among the general population (all adults 18 and over) in the coffee chain category, with Krispy Kreme coming in second place, and Starbucks a distant third. 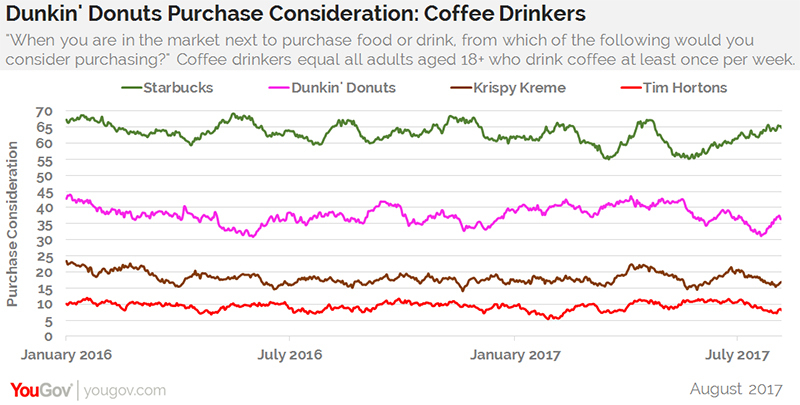 So while Dunkin’ Donuts may want to be famous for its coffee, in reality, consumers seem to appreciate its broader offerings, including the “donuts” in its name. 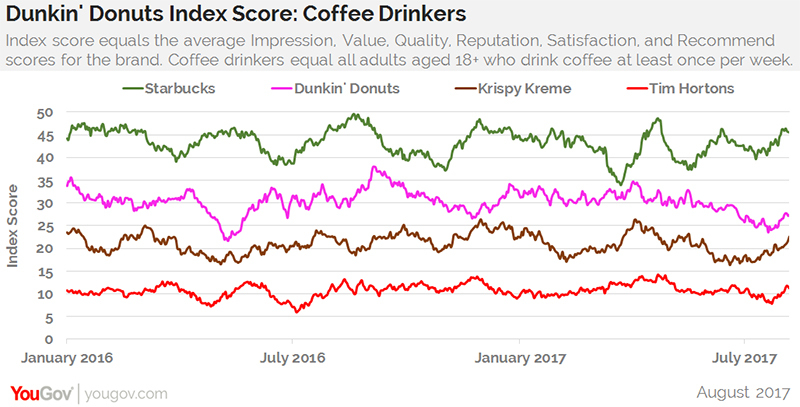 As a matter of fact, Dunkin’ Donuts’ brand health metrics with coffee drinkers slipped over the past four months, putting it within close range of third place Krispy Kreme. In potential revenue metrics, the difference between coffee drinkers and the general population is also quite stark. Starbucks has the highest purchase consideration numbers with coffee drinkers in the category: 65% of them would consider Starbucks the next time they’re looking to buy coffee, compared to 37% for Dunkin’ Donuts, 17% for Krispy Kreme, and 8% for Tim Hortons. 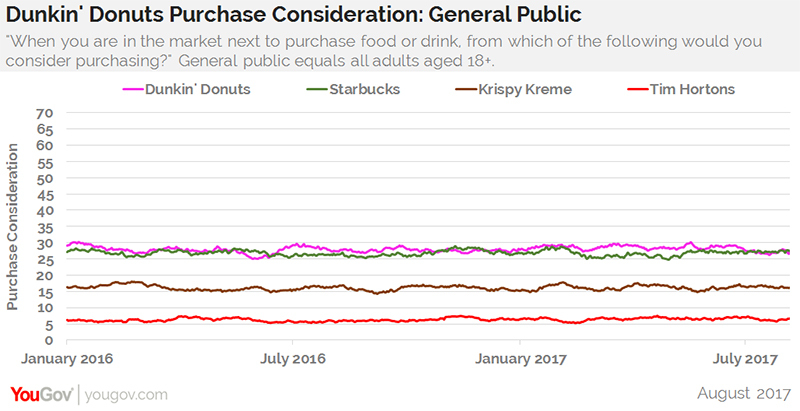 However, for the general population, Starbucks and Dunkin’ Donuts are in a neck-and-neck fight, both of them hitting the 27% to 28% range of purchase consideration. These numbers imply that while coffee may be Starbucks’ advantage, Dunkin Donuts’ more general appeal helps it to close the gap. YouGov BrandIndex measured brand health with its flagship Index score, a composite of its General Impression, Quality, Reputation, Satisfaction, Value, and Willingness to Recommend scores. A score can range from -100 to 100 with a zero score equaling a neutral position. Coffee drinkers are adults 18 and over who drink coffee at least once a week. The general population includes all adults 18 and over.